You’re a smart cookie if you want to understand the ins and outs of index funds and ETFs. They are exploding in popularity and this is an area that is bound to grow more and more over the coming years. But in order to understand the world of index funds and ETFs it’s important to break the topic down and then build back up. First let’s talk about index funds and then we’ll look at ETFs (even though they share a lot in common). A stock index fund is a pool of assets that is invested in the same stocks as a certain index. There are thousands of indexes. It seems that more and more indexes are created each year and more and more companies are spitting out funds that mirror those indexes all the time. People from all over the world contribute and own shares in the index fund if they are marketed well. This is just like any other mutual fund or ETF. The unique element is the “index” part of the investment. Most mutual funds have managers who buy and sell different stocks and bonds within the fund based on their own criteria. This is called active management. An index fund or ETF doesn’t do that. They simply mirror the investments held in various indexes and they hold on to those positions until the people who own the index make changes. In effect, the stock index fund and ETF outsources the management, research and decision making process to the people who own the index. This is called “passive investing”. This outsourcing drives the cost way down because the index fund doesn’t have to hire the fancy (expensive) fund manager or management team. This also reduces costs because lower trading also results in fewer short-term and long-term realized taxable gains. Index fund proponents argue that these cost reductions result in better returns for investors. They continue by saying that most mutual funds fail to perform as well as the indexes – which is true. In any given year up to 85% of the actively managed funds fail to perform as well as the index (but read this post ENTIRELY before coming to any conclusions please). As a result of the cost savings inherent in index fund investing and the performance lag of other competing alternatives, stock index funds and ETFs have attracted a lot of attention. Is it really so simple? Are index investments always better than mutual funds? Is it an open and shut case? No, it is not. Few things are black and white in life. Stock index funds are no exception. It is true that stock index funds have (as a general rule) lower management expenses compared to other funds. And those cost savings absolutely help boost performance. And if performance (before fees) was equal among all funds, that fund with lower costs would always be the best performer. But all funds don’t perform equally well. And it absolutely critical to understand performance when evaluating mutual funds. 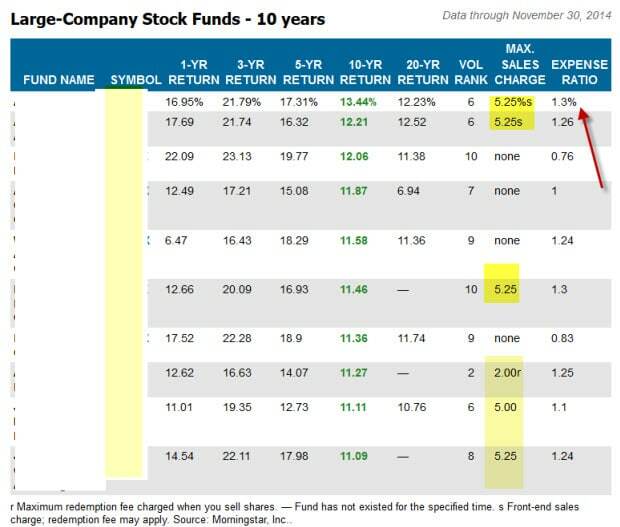 As you can see, most of the top performers are mutual funds (with high expenses) – not index funds. Some even have sales charges for crying out loud. I wouldn’t suggest you buy loaded funds of course. And I am not saying that high fees are OK. But are you surprised to see that the best performers were NOT index funds and that the winners had higher expenses than the index fund? How is that possible if the argument the pro-indexers put forward is true? Well….eh….actually… their argument is only partially true. You see, when you look at fund performance in Yahoo! or in the paper, that performance is quoted net of all fees. In other words, when you see performance numbers for funds, it nets out the investment fees for you. So when you compare funds by their performance, you don’t have to subtract out the fees the fund charges. That’s already built in. And while it’s true that most funds fail to beat the index, some funds do. Depending on the market cycle, the percentage of funds that beat the index can be 15% or more. There are more than 10,000 funds available now. That means there are at least 1500 funds that did beat the market last year hypothetically. That’s not too bad. There are funds that beat the indexes. Sometimes it will be easier to find those funds than other times, but they are always there. 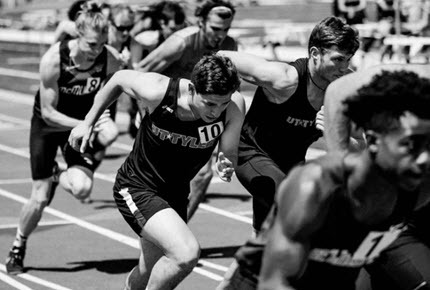 It’s not simple to identify those outperformers if you have no system to do so. But if you do use a numbers-based method it’s not impossible either. I’ve written about investment systems that are designed to do that before (while no guarantees of success can be made). And remember, beating the market may not be your only or top goal. If the market drops 30% and you “only” lose 20%, you beat the market but that result might still be unacceptable. That’s why the topic of risk is so important when it comes to index funds and how you choose your investments. Many investors falsely assume that stock index funds are all broadly based and are modest risk investments. But this is not true. All stock index funds are not alike. Consider two examples. SPY is a very broad index fund and it generally tracks the performance of the S&P 500. This stock index fund holds 500 stocks and has very low expenses. The stocks are in different industries and sectors. This is indeed a moderate risk portfolio. Now consider XLE. This is a stock index fund too but it replicates an energy index. It is very narrowly based. And this index fund holds only 43 stocks currently. Both SPY and XLE are stock index funds but they are hardly in the same risk category. SPY is a broadly based fund and appropriate for a moderate portfolio. XLE on the other hand is a highly volatile investment only suitable for investors willing to take on a great deal of risk. Stock index funds might be a great addition to your investment holdings. But don’t assume that your index fund is going to turn in good performance or that the risks are low. As you can see, there will always be a big crop of mutual funds that beat index funds. On top of that, some stock index funds have much higher risk than actively managed mutual funds. Let’s focus a bit more on ETFs now. How Is An ETF (Exchange Traded Fund) Different From And Index Fund? Glad you asked. In its most simple terms, ETFs are similar to index funds. Some compete with index funds and buy the very same shares as those funds. Some buy very esoteric stocks. But the main difference between an index fund and an ETF (exchange traded fund) is that the ETF trades like a stock and usually the ETF is even cheaper than the fund. You can buy an ETF during the day and know what price you’ll pay for it before you buy it– unlike a mutual fund or index fund. You can sell it short and you can use limit orders to protect your investments. Oh… and one more thing… ETFs are typically even less expensive than index funds. Oh…and one more, one more thing. Because the ETF managers trade so infrequently, investors have less potential exposure to capital gains tax. In short, ETFs have the same benefits of index funds and then some. But investors still need to monitor risk and performance. As with mutual funds, index funds and ETFs, your strategy is what’s most important. The investment pick itself is less critical. If you are a buy and hold investor, ETFs or index funds can be good options. I’m the first one to admit it. But if you buy funds based on performance, your selection method will tell you what to do. For example, one investment strategy I’ve written about before evaluates mutual funds and compares them to ETFs. It then ranks funds and ETFs by performance and buys the strongest of the lot. If (as people argue) ETFs perform better because their expenses are lower, they will be at the top of the list. We saw at the top of this post, that cheapest fund is NOT always the best performer. If you have a system that only buys top-performing funds and ETFs and then rebalance your portfolio periodically, you’ll buy ETFs when they are doing well and you’ll ignore them when they aren’t. That sounds better to me. Bueno. But keep this very important point in mind; the argument of only buying the cheapest funds can actually be very expensive because it completely ignores funds that might be doing far better. By doing so, you might give up a dollar to save a nickel. Embarrassing. It makes even more sense to consider performance, cost and volatility rather than just cost. What About Commission Free ETFs? The bigger brokerage firms are beginning to offer a set of Exchange Traded Funds that you can buy and sell without paying a commission. Each firm has a different list of commission-free ETFs. Some firms offer lots of commission free choices and others offer very few. Exclusively using commission-free ETFs could save you thousands of dollars in fees over your life time, allowing you to invest that money instead of your broker profiting off of it. That could result in a significantly larger portfolio for you over the years. So, yes, the idea is good. But examine carefully which commission free ETFs you have access to. As I said, some brokers offer very limited options and others have highly illiquid ETFs on their list. Check this out carefully before investing. Never make an investment decision based on cost alone. Look at cost, yes. But consider alternatives, performance, risk and liquidity please. Actively managed ETFs are also pooled assets like mutual funds and they also trade during the day like traditional ETFs. But unlike old school ETFs, actively managed ETFs don’t just buy securities that make up an index. Like actively managed mutual funds, actively managed ETFs buy and sell stocks at the discretion of the manager. That means they need to spend more time and money on trading and that costs investors more in higher fees. More on this in a minute. Why Do Actively Managed ETFs exist? The big attraction towards passive ETFs has always been the low-cost, high liquidity and good performance that accompanied buying and holding the index. But actively managed ETFs are more hands-on as I said. There can be a lot more trading going on with active ETFs. That means the fund will have to invest more money to build a management team and infrastructure. Someone has to pay for this of course. And that someone is you. Active ETFs often have higher costs when compared to passive ETFs. These of course are all negatives. But the financial service industry created actively managed ETFs despite these drawbacks. They did so because they hoped to make up for those shortfalls (and then some) by outperforming their slower-moving traditional peers. The concept was if they do earn higher returns, more investment dollars would flow into these funds. Of course if that happens, the companies earn even more fees – which is the reason they exist in the first place. Do Actively Managed ETFs Deliver? Yes and no. Some actively managed ETFs do outperform over a given time period and others don’t. This is very similar to the mutual fund situation. Some actively managed funds serve up outsized returns too – for a while – while others languish. My experience tells me that picking the right investment vehicle. (Active, passive, ETF, mutual fund) is important, but it’s only a small part of your investment success. What’s far more important, again in my experience, is the manner in which you invest; the process you use to select the specific fund, when to buy it and when to sell it. Some of these puppies do have an edge but make sure you know what it is. In order to know that, you have to ask lots of questions. Generally speaking, the broad indexes are really hard to beat so you might look towards other more esoteric indexes if you are interested in actively managed ETFs. This would be in the international, small cap and specialty bond sectors. But if you do stick your toes in the water, be careful. The average actively managed ETF is only 1 ½ years old and only manages a small investment base. That means they may not be seasoned and they may not have the liquidity you are looking for. Some people view the introduction of active ETFs as a good thing. For me, it’s rather ho hum. But part of me sees this as just another way for the industry to inject something new into the market in order to capture the interest of investors. I liken it to the soft drink industry introducing a “new” drink that really isn’t that new. If you are a buy and hold investor, actively managed funds probably should stay off your radar. And if you are performance based investor, these newbie options will show up on your list if their performance delivers. In either case, I wouldn’t go out of my way to sink money into these investments – but I wouldn’t avoid them if a specific fund makes the grade. A leveraged stock ETF fund is a fund that magnifies market returns – both good and bad. A leveraged fund might perform twice as well (or poorly) as a typical fund. If you are a speculator and are very bullish (or bearish) about the market, a leveraged fund might catch your eye. Let’s say you are “sure” the market is going to go up by 20%. In that case, you might start looking around for a leveraged fund that will double that performance. That way your fund will go up by 40% if you are right. Of course if you are wrong, you could get really smacked. The risk is double. Please don’t forget that. Also, keep in mind that the way these funds get the leverage is by investing in derivatives and debt instruments. Most investors don’t understand these investments. If you aren’t comfortable with those types of investments, stay away from leveraged ETFs. Last, remember that you can’t ever be sure about an investment outcome. People tell me all the time that given one set of circumstances or another, a certain investment outcome is inevitable. Let me share with you that there is no such thing as an inevitable investment outcome. There are too many variables. There are forces acting on investments that you aren’t aware of. I met a gentleman who was sure a certain bank stock was going to do gangbusters after the financial collapse in 2008. He was right… and he still lost money. How? He held the stock until it skyrocketed which was great. But he kept holding it when the rocket fell back to earth. This wasn’t a leveraged fund but it illustrates how dangerous speculating can be no matter how sure you are. Nowadays you can buy just about any kind of ETF you like – including ETFs that hold dividend paying stocks. What’s cool about this idea is that if you choose carefully, you can buy very low cost ETFs and enjoy those juicy dividends at the same time. Win-win. If interest rates rise, these stocks could get clobbered. That’s because when rates go up, investors who own high dividend stocks could dump those holdings and buy lower risk government bonds. Higher quality blue chip companies are paying between 2% and 4% dividends right now. If investors are offered the opportunity to snag the same rate with less risk, some will. And if those investors sell those dividend stocks to buy the bonds when rates increase, the stock prices could drop. If your ETF holds those stocks, the value of the ETF could get roughed up. As I said above, some high quality blue chips are paying 2% to 4%. But there are other dividend paying stocks which pay much higher rates and many dividend ETFs own both kinds of stocks. Good examples of these dividend stocks are Master Limited Partnerships (MLPs) and Real Estate Investment Trusts (REITs). Many of these stocks pay 7% or more. While the blue chip stocks pay dividends almost as a side component, the lion’s share of the return offered by MLPs and REITs is the dividend. But if these companies run into financial hardship and reduce or suspend their dividend, their share price could sink like a stone. Even if the underlying business remains solid, these companies are highly interest-rate sensitive. If rates go up, so do their costs. And if their costs increase, they may not have the cash to pay those fat dividends. In short, if rates go up, they could clobbered too – and so will the ETFs which hold them. Some people feel that the only way to squeeze income out of ETFs or funds is by owning dividend paying securities but that’s just not true. You can buy equity funds that pay no dividend and still create monthly income from those investments. Why restrict your holdings to only those which pay dividends? I’m not saying you should necessarily rule these funds out, but I urge you to evaluate your holdings based on total return potential and risk rather than just making a buy/no buy decision based on the dividends alone. Higher paying dividends often come from defensive sectors of the economy and they may not grow as much as other companies might if the economy continues to improve. Companies which forgo the dividend payout are able to invest that money in themselves. If they are solid companies, that growth can translate into higher share prices. And if you own companies like that, your account can potentially grow faster while still providing solid income. High dividend ETFs might be appropriate for part of your portfolio but please evaluate these investments with a big picture perspective. Consider the risks you take and the potential gains. Then, as always, compare this opportunity to other alternatives. If you are trying to maximize your long-term income potential, these ETFs might not always be your best choice. Investors are looking for better investments that offer protection from inflation and growth potential given the rocky investment environment we’re all dealing with. Are CEFs the answer? Maybe. Closed end fund (CEFs) aren’t really index funds or ETFs but they share many attributes. They are alike in that they pool investors’ assets. Managers take that money and buy shares or bonds of companies they think offer attractive potential returns. But ETFs and funds can keep on taking in money. As new money comes in the door, the managers of mutual funds simply buy more investments. Closed End Funds (CEFs) are very different. Once they raise a set amount of money, that’s it. No more money is allowed in. This sets up a very different dynamic for CEF investors as compared to mutual fund investors. If you own a mutual fund, the value of that fund will always be very close to the value of the investments held in that fund. Let’s use a simple example. Say the ABC ETF or fund raises $100 and issues 100 shares for $1 a piece. It buys 10 shares in the XYZ Company for $10 a piece. If the value of XYZ rises to $12 a share, the value of the fund rises to $120 and each share is worth $1.20. That’s what mutual fund performance is all about. If the ABC fund now sells 100 additional shares, they’ll get a total of $120 from new investors (this is somewhat oversimplified, but it illustrates the point). The total assets of the mutual fund will be $240 and there will be 200 shares – or a value of $1.20 a share. So far so good. Let’s assume that ABC is a Closed End Fund instead of an ETF. Let’s assume ABC sells 100 shares for $1 a piece. They sell all the shares and collect $100. The manager of ABC goes out and buys 10 shares of XZY Company for $10 a share. And just like before, the value of XYZ goes up to $12 a share. The value of the shares now becomes $1.20, just like the mutual fund. But now, other people want a piece of the action. Since the CEF can’t issue more shares, new investors are going to have to fight with each other over the existing shares. What happens to the value of ABC Closed End Fund when lots of investors are hungry to buy shares? The price rises. So even though the underlying value of ABC is $1.20, the price will be bid up if investors think the managers are particularly skilled. Because the price of the shares of the closed end fund exceeds the value of the underlying assets, these shares are known to be trading at a premium. Of course the opposite can also happen. Assume people expect the manager to do a particularly poor job and nobody wants those assets or the manager. If existing share owners want out, they’ll have to settle on a price below the value of the underlying securities. Another differentiator between CEFs and other mainstream investments is the use of leverage – or borrowed money. According to the Investor’s Business Daily, about three out of four Closed End Funds are leveraged. That means if the manager is right on what to buy, the returns will be greater than the overall market because the manager is using borrowed money to invest. But if the manager is wrong, the returns will be worse than the market. Possibly much worse. The Investor’s Business Daily looked at the period 9-1-2008 through 12-31-2008. Granted this was a very tough year for the market, but it illustrates the point pretty well. During that period, the typical high-yield CEF lost 36.8% while the high-yield index “only” lost 19.9%. So the CEF lost almost twice as much, and that was mainly because of the leverage and borrowed money it invested. The leverage will work for or against you if your fund buys junk bonds, preferred shares or blue chip stocks. It doesn’t matter. Of course, during good times, this leverage can really pay off for you. But in deciding between a CEF and a mutual fund, the main consideration should be your goals and how much risk you are comfortable with. If you buy a great CEF during a very bad market, you might be able to buy it at a significant discount. On top of that, if the market starts behaving well, you might zoom ahead quicker than a mutual fund or ETF because of the leverage. On the other hand, if the market does poorly, that discount might become greater and the use of leverage will amplify your losses. As you can see, you have to be very clear on what your appetite for risk is before making this decision . This is yet another example where simply looking at returns and selecting your investments based on those returns could end up to be a very costly error. For most conservative investors, closed end funds aren’t worth the trouble. Every investment has its problems and controversy and ETFs are no different. One issue the industry is dealing with now is the topic of “securities lending”. This means that ETFs and mutual funds can rent out the securities they hold in their portfolios (if their prospectus allows it). When you select your ETFs, please don’t ignore this. Here’s why. If you can handle that risk, the practice isn’t terrible per se. Keep in mind that securities lending is extremely lucrative. According to Market Group Ltd, the average fee these companies receive is in the neighborhood of 40 basis points (.4%). So far so good. But what isn’t so good is when the fund companies slip a little too much of what they collect into their own pockets. There was a law suit that Investment News reported on which talks about a complaint by two large investors. They claim that iShares earned about $500 million in 2011 and part of 2012 through securities lending. And while the prospectus allows iShares to pocket 35% of those fees, the suit alleges that the firm actually snatched up 40%. That extra 5% represents $25 million dollars. I don’t know about you, but to me that’s a lot of cabbage. But this $25 million isn’t the main point if you ask me. My question is, why should the fund company keep any of these profits? It belongs to the shareholders – not the fund. There is no question that this “wealth redistribution” by the company hurts ETF investors. If you want to make sure that your fund company doesn’t eat your lunch, all you have to do is spend an extra 5 minutes and review the prospectus. It isn’t that complicated and most aren’t written in legalese. Open up the prospectus and Statement of Additional Information on line. Then do a search for the term “securities lending”. I looked at a few ETF prospectuses and when I did that search I found that all three of the largest ETF companies engage in securities lending. But each of these companies kept different amounts. Some kept none of the fees. They passed all the money to their investors. Other firms kept a great big piece of the pie. I must admit that while it was easy to discover that the funds engage in this practice of lending out holdings, it was very difficult to identify the amount they charge for doing so. If you are unable to find the number that spells out the split, just call the company and ask. While you are at it, check on your mutual funds as well. As I said, they too may be involved in securities lending without you knowing about it. There is nothing wrong with investment companies making money. But there is a lot wrong with an investment firm that gets too greedy. Make sure you know if the ETFs and funds you buy lend out securities and if so, how much of the premiums are passed on to the investors and how they retain. Securities Lending Risk. The Fund may engage in securities lending. Securities lending involves the risk that the Fund may lose money because the borrower of the Fund’s loaned securities fails to return the securities in a timely manner or at all. The Fund could also lose money in the event of a decline in the value of the collateral provided for loaned securities or a decline in the value of any investments made with cash collateral. These events could also trigger adverse tax consequences for the Fund. If you are a buy and hold investor, ETFs and index funds might be suitable investments for you. Many are highly liquid and very inexpensive. The key issue here is, make sure you buy the right funds. They must be consistent with your long-term goals and risk tolerance. If you prefer to be more hands-on (which I strongly support doing) ETFs and index funds are fine investment candidates. But rely on your investment strategy to select your particular holdings. Don’t decide what to invest in solely based on cost. Fund performance and risk are far more important.